Thank you very much! Steve’s class at Virtuoso Distilleries in South Bend was excellent and very informative (and excellently priced at only $200)! It was awesome to meet you and your son and get to see the iStills in action. I believe the biggest lesson I walked away from the class with was that $180,000.00+ Holstein and the ~$7500.00 iStill 250 can both put out 10 gallons of spirit heart cuts in a single run. However…. the iStill 250 run was only 3 hours, whereas the Holstein was just over 4 hours. WOW!!!!! I am truly blown away at the production rate of that rig. I’ve seen all you videos, but it’s just different to watch 5-gallon carboys get completely filled in a single hour once the rig is up to temp. 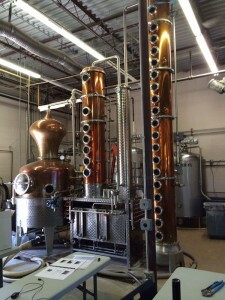 I will own an iStill 250, when I open my distillery! And the gin you made during the day! To taste an exceptional gin that I watched come directly off the still only hours before we tasted it was a real treat! I can only imagine how good it will be after a 5 week rest. I have not dabbled in gin making yet, but it will surely be one of my projects for 2014. Once I’ve made gin, I will be bothering you for help with genever. It was a real treat to spend the day with Steve and yourself and soak up as much information as possible. Meeting other distillers is one of the most exciting part of this hobby for me… I always learn so much. I’m still laughing about the story of your trip to Miami, Odin! That has got to be one of the funniest stories I’ve ever heard!!! I also want to say that you guys in Chicago have a real treat (in my opinion) with Gosse Island Clybourne. All the food and beers I had there were outstanding. There aren’t many places near me where you can get poutin… let alone topped with beef brisket. That place was a real treat! 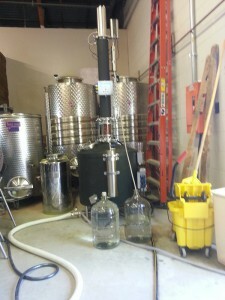 My picture isn’t very clear, but the 2 carboys in the iStill 250 picture were filled with gin in 3 hours. That’s from the very start of heat up time to shutdown…. 3 total hours. ← Really? The iStripper’s … manhole?